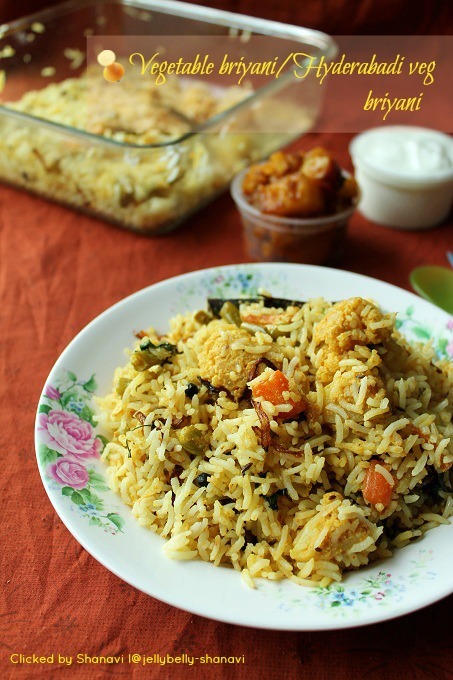 Hyderabadi veg Biryani is one healthy biryani loaded with veggie's and of course spices. In this, vegetables are cooked in a rich creamy gravy obtained by grinding coconut, kasa kasa and yogurt and cooked with spices. Few days back I'd watched a cookery show where the chef told it is mandatory to blanch the veggies for making veg pulao's and biryani's. I always considered it to be time- consuming, but after watching that show I convinced myself to try hereafter, after all it's just an extra two to three minutes of my time. So, when I attempted to make the biryani, I exactly followed the procedure to T and therefore the result was amazing and loved it to the core. I always add biryani masala (esp aachi and shaan) to all the biryani, but again, it's totally ur family's choice to include, cos I've heard people saying too spicy cos of the whole gram masala's with additional biryani masala powder. As for baking the biryani I've referred few blogs to get an idea for the temperature needed , in particular, I kinda went with manjula's kitchen for baking the rice. Njoy ppl..
Cinnamon -- 1" piece, 2 nos. Bay leaves -- 1 no. Soak the khus khus in a tbsp of water for 10 minutes. Soak the basmati rice for 10 minutes. It is mandatory to blanch the vegetables for veg biryani. So, boil 2 of water and add the green peas, carrrot, beans and boil for 1 minute. And then add the potatoes and the cauliflower and again boil for 1 minutes. Drain the water completely and place the colander(loaded with veggie's) under the tap water and let the vegetables be in the cool water for a minute and drain completely. Keep aside. Prepare the wet masala by grinding the coconut with the soaked khus khus+ cashews + curd/yogurt and grind to a paste. 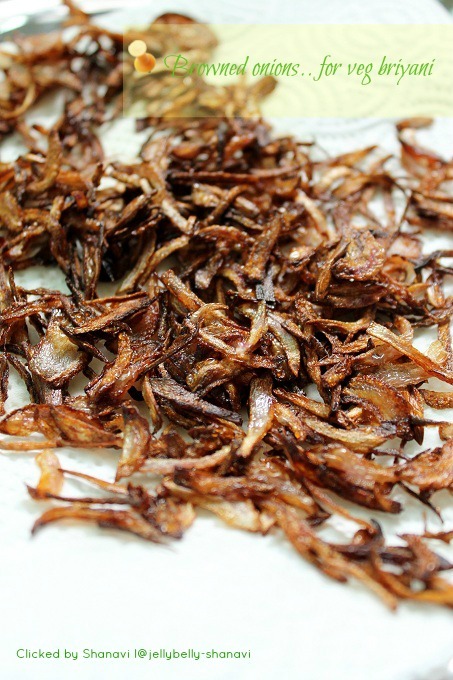 Heat a heavy bottomed non stick pan with oil and 2 tbsp ghee, fry the julienne d onions with a pinch of salt on the medium low flame until it turns golden brown, like in the pic. Drain the fried onions using a kitchen tissue and carry on frying the cashews and the raisins with the same oil and drain that as well. Now with the same oil, do the seasoning. Fry the spices one by one(cinnamon,cloves,cardamom,mace,bay leaves) and add the ginger garlic paste and fry them as well for 1 minute over medium flame. To this add the blanched vegetables, cubed tomatoes and mix them thoroughly with the spices. Add the biryani masala powder, red chilli powder, turmeric powder, salt to the vegetables and toss them so that it gets mixed well. Cover and cook for a minute so that the raw smell of the spices goes away. Turn down the flame to medium low. Add the ground masala to the vegetables and combine them thoroughly. add the mint leaves and mix well. Again cover and cook the vegetables for 3 more minutes / until the gravy has slightly thickened. Finally add a pinch of sugar to the masala and combine well. Meanwhile prepare the rice by boiling 6 cups of water with salt, oil or lemon juice and slowly add the soaked basmati rice. Cook until the rice is 3/4th cooked. Drain the water and spread the rice on a wide plate / wide bowl. Preheat the oven to 350 deg F / 180 deg C. Take a clean casserole or any oven baked dish and grease the bottom with oil. Add a layer of rice to the bottom of the pan ,add some saffron milk and top it with a layer of vegetable masala. Again follow the same routine until u r done with the masala. Finally add the rest of the saffron milk, fried onions, coriander leaves, cashews, raisins on top of the rice and drizzle with the given 1 tbsp of ghee. 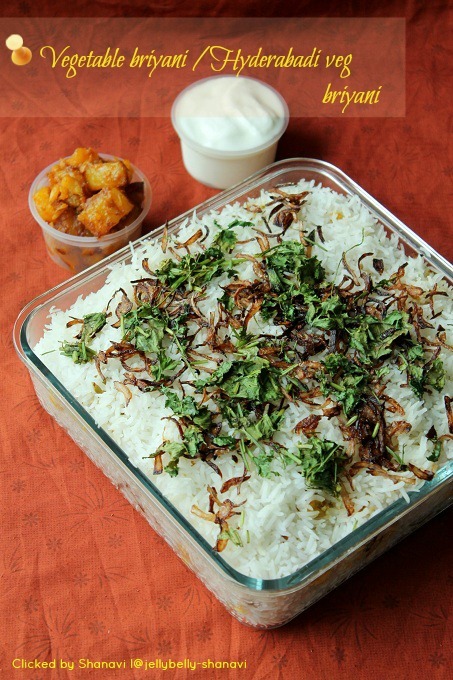 Now bake the briyani for 15 to 20 minutes (depends on ur oven) / until the rice gets cooked. Switch off the oven. Let the biryani sit inside the oven for another 15 minutes. Use the fork to fluff up the rice from the bottom to the top and carefully mix them without breaking the grainy rice. Though it might seem like a big process , it really is not. Just plan ur steps and it will be very easy. Adding lemon juice to the rice ensures the rice to be grainy not sticky. I've learnt this trick from Chef Damu Sir's program. There after I use only lemon juice, not oil. We, my family, in general we add coconut to almost all the items( we even add to sambar..lol) But I suggest u add the given amount of coconut + khus khus , cashew paste as it really makes the biryani very rich. U may avoid the whole masala's (cinnamon,cardamom,cloves..etc), instead add a tsp of garam masala powder. Adding a pinch of sugar, enhances the taste so better not avoid adding it.I din't add any colour except turmeric powder to my biryani and so is this colour. love hyderabadi style biriyani.. delectable n delicious..
Super Sho very well done. I can taste the food from your clicks. Full of flavors...I just love this..yum...You made it so perfectly..
Yummy and flavorful biryani,makes me hungry. Love u .Biriyani looks amazing.cute pictures. 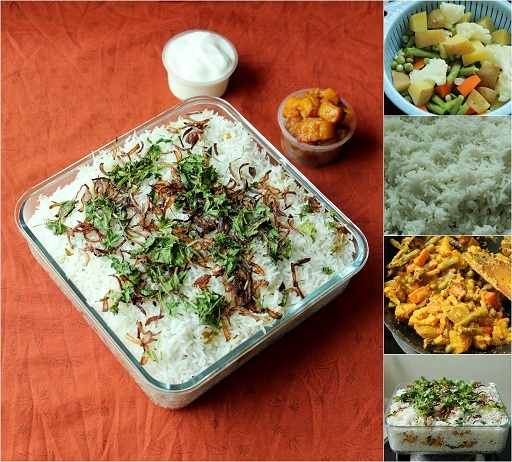 Comforting rice for me and love to have any time..Superb clicks as usual..
Feel like inviting myself to your place Shobana, such an irresistible briyani. Luv hyderabadi biryani...looks so inviting. 1st heartful appreciations 4 cliks.so cool n beautiful..feeling like I`m tasting it r8 nw.. The biryani looks stunning and delicious! Lovely clicks. A Soulful Biryani and Love your blog too and happily following it..
Wow! 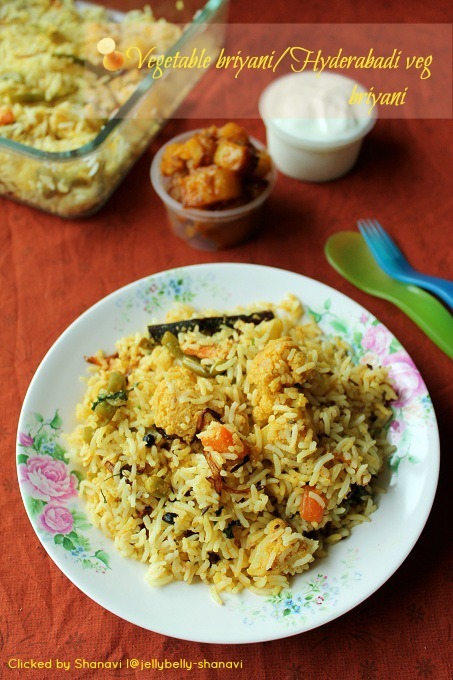 Briyani looks super Delicious..Your Blog looks Awesome..